“We are taking steps on the area of energy which has strategic importance,” Prime Minister Recep Tayyip Erdoğan said, speaking at a press conference with Azerbaijani President Ilham Aliyev. 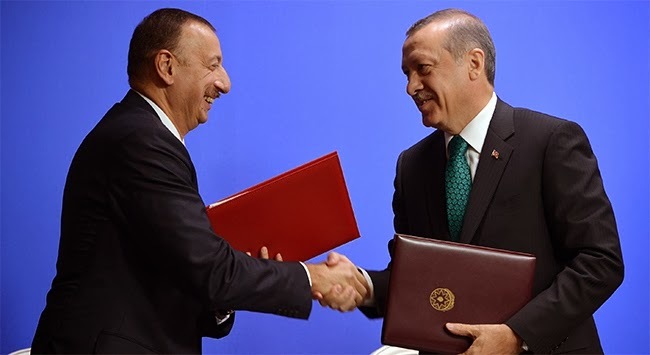 Turkey and Azerbaijan would work to bilaterally boost trade up from the current level of $4.2 billion per annum to $15 billion by 2020, Erdoğan noted. 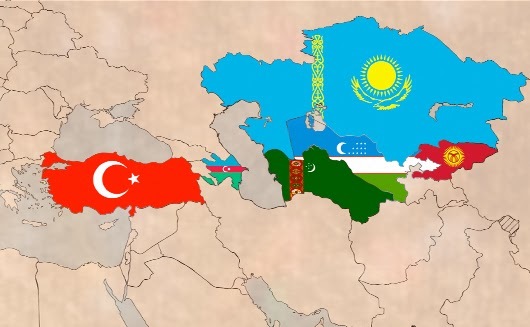 Aliyev explained the ambitious objective of the two countries during his trip when he stated that "the 21st century will be the century of the Turkic world." In order to make this happen, Azerbaijan and Turkey want to increase their influence in Central Asia by strengthening ties with Kazakhstan, Kyrgyzstan, Uzbekistan and Turkmenistan via the Cooperation Council of Turkic-Speaking States. NATO will not cooperate with the Collective Security Treaty Organization (CSTO), the North-Atlantic alliance wants to cooperate with the countries of the organization individually, NATO Secretary-General Anders Fogh Rasmussen said on Tuesday in Brussels, reported RIA Novosti. Dzhaksybekov informed the American Secretary that Kazakhstan was transitioning from recruits to a professional army. "American armed forces have ample experience in running a professional army, and we are interested in an experience exchange in personnel management, recruitment, budget planning and social packaging. 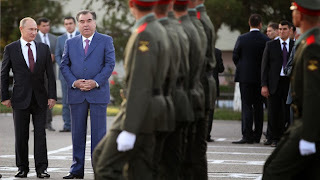 We are aware that any transformations are only as good and the people who make them, so it is very important for us that Kazakhstan military officers can study in American military schools. We are interested in establishing a cooperation between American and Kazakhstan military schools and are ready to cooperate in military science as well," Dzhaksybekov said. The Kazakhstan military delegation led by the Defense Minister also met with representatives of leading American defense companies like General Atomics, Boeing Defense, OshKosh, Lockheed Martin and Sikorsky. Minister Dzhaksybekov had a number of bilateral meetings with them to discuss mutually beneficial cooperation. Azerbaijani Defense Ministry told APA that NATO experts will organize a number of trainings on different topics for the staff of the Azerbaijani Armed Forces. Opportunities for cooperation in the field of military education will be also discussed. The US embassy in Baku is finding itself in an awkward situation following Azerbaijan’s October 9 presidential vote as it faces unprecedented claims from both the presidential administration and Ministry of Defense that the US allegedly “advised” the government how much of the vote should be “given” to President Ilham Aliyev. THE Foreign and Commonwealth Office paid for the SAS to train Azerbaijan’s special forces in an effort to gain influence with the hardline ex-Soviet regime. According to a leaked document seen by The Sunday Times, members of the UK’s elite fighting force taught their counterparts sniper skills and how to storm buildings as part of a six-week training mission. War In The South Caucasus?! During a visit to Switzerland in mid-October, Turkish Foreign Minister Ahmet Davutoglu said that Ankara is ready to normalize relations with Armenia, while stressing Yerevan should first exit from the Azerbaijani territory it occupied, Turkey's Today's Zaman reported on Tuesday. The foreign minister said once Switzerland convinces Armenia to leave Nagorno-Karabakh, Ankara will open its borders with Armenia. 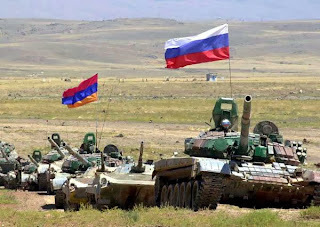 “If Azerbaijan decides to restore jurisdiction over Nagorno-Karabakh by force the [Russian] military base may join in the armed conflict in accordance with the Russian Federation’s obligations within the framework of the Collective Security Treaty Organization (CSTO)." 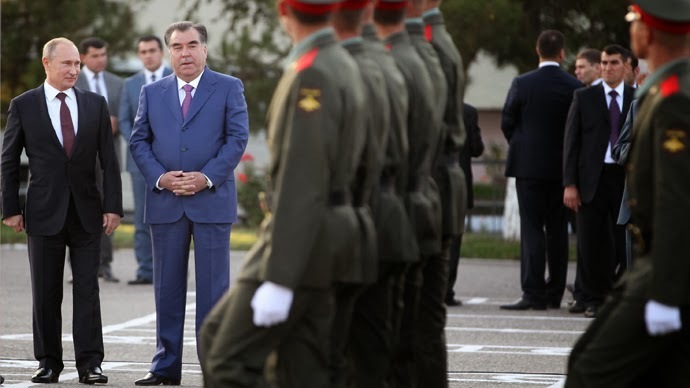 At first Baku naturally blamed Armenia for the comments of Colonel Ruzinsky before Azerbaijan's Defense Minister addressed the issue during a meeting of the OSCE Minsk Group, which is tasked with resolving the disput over Nagorno-Karabakh. Russia will strengthen its air contingent at the Erebuni air base in Armenia with a helicopter squadron in the next few months, the base commander said Friday, according to RIA Novosti. "We are moving [the base] to a division structure, by December we will complete this division to about 80 percent, and by the time of elections in Afghanistan and the departure of the coalition forces we will complete it 100 percent with the newest weaponry and military equipment." A commander of the Afghan special forces has joined the Taliban group in eastern Kunar province of Afghanistan. Provincial governor, Shuja-ul-Malik has confirmed the report and said that the commander has taken a tank along with some weapons and ammunition with him. The head of the Moscow-led Collective Security Treaty Organization said Thursday that the military bloc should boost its peacekeeping capabilities in response to developing internal threats. CSTO general secretary Nikolai Bordyuzha said he saw a particular danger coming from countries on the geographic fringes of the bloc, a clear reference to Afghanistan. 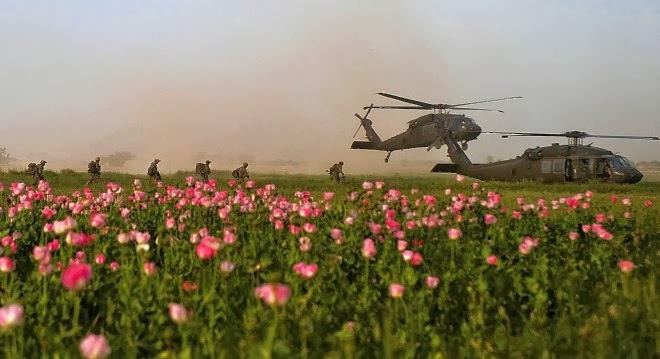 Afghanistan, long the world’s main heroin supplier, has seen its total area of poppy seed plantations explode to 516,000 acres - a 36 percent increase from 2012, according to the report, released on Wednesday. NATO's legacy in Afghanistan is easily summarized: endless opium and dead civilians. Efforts to hold the foreign troops accountable for civilian deaths are constantly stymied. Immunity for U.S. troops remains one of the most contentious points in negotiations about the bilateral security agreement between Afghanistan and the United States. Although the two sides agreed on a draft, which will be submitted to Afghanistan's grand council (Loya Jirga), the important issue remains unresolved. Kabul University law professor Wadir Safi says some of the individuals in question should not be running free, let alone running for office. "The West is culpable in [letting the warlords run in elections]," he said. "Even now if the West wants, they can push them out of the presidential race. They have their lists and can take them away irrespective of whether they are candidates." Adams says that President Hamid Karzai and his Western backers share the blame for failing to prosecute individuals responsible for grave human rights violations that took place in Afghanistan over the past 35 years. The illicit trade of voter cards has already begun as the presidential election looms, sparking concerns regarding the transparency of the elections which is scheduled to be organized earlier in April next year. Sayed Gul, who used to used to repair cars in Marco, a small town in eastern Afghanistan, has left his job and has joined a hriving industry selling the outcome of next year’s presidential elections. Gul told Reuters that he was able to buy voter cards for 200 Pakistani rupees ($1.89) each from villagers and sell them on for 500 rupees ($4.73) to campaign managers, who can use them in connivance with poll officials to cast seemingly legitimate votes. The threat of the insurgents, who oppose the election, was used at the last poll in 2009 to perpetuate widespread rigging, observers said. Thomas Ruttig, the co-founder of the Afghan Analysts Network, described how a group of men claiming to be Taliban fighters stormed a polling booth in an eastern province when the vote was on. "Everyone fled. The ballot boxes were empty beforehand, and full afterwards," he said.